Birn+Partners expand and open daughter company in Helsinki, Finland in beginning of 2014, Tallinn 2015, and Riga 2016. “With 20% of our turnover crossing borders in Europe, we will be expanding our activities and setting up daughter companies throughout Europe the next 5 years as well. It is important that we can provide all our services at our clients locations and follow their international setup and growth.” Says Mikkel F. Birn, Managing Partner. Our team in Helsinki consist of well-known headhunters in the Finnish market. 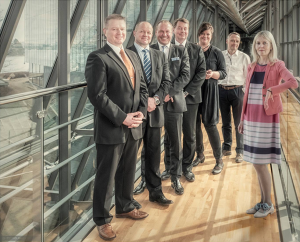 Harri Immonen, Veli-Pekka Hakkarainen, Kari Forss, Heikki Silfver, Tiina-Maija Mannervaara and Anita Raunio adding together another 10 years of consulting and headhunting experience from Finance, IT, Energy/Engineering and FMCG, Organisational management and Marketing knowledge to Birn+Partners. Furtmore, our focus in the Baltics are paying off with two locations in Estonia and Latvia. In Estonia, we are getting an even stronger foothold in the recruiting market, and in Latvia we recently won a big public tender regarding Assessment & Development.